Below is a short video I created to showcase a self-help book by David Parker: The More You Do The Better You Feel: How to Overcome Procrastination and Live a Happier Life. I encourage you to create a similar video for your book. If you don’t know how to create such a promo video for your book, I can do it for you. And relatively inexpensively: Only $40. If you’d like me to create a video for you like the one above, click on the button below. Not only will you get the video to use wherever you like, but you’ll also receive the PowerPoint slides that make up the video (as well as the images within the video). Once you order, all I need from you is the cover of your book you want to feature in the Great Books Video I create for you. You can email your cover to me via bookpromotionexpert@gmail.com. Would you like to see another Great Books Video? 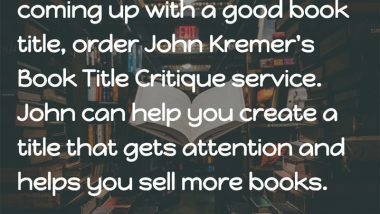 Check out this one as well for John Kremer’s 1001 Ways to Market Your Books, Real World Edition: How to sell more book, ebooks, multi-media books, audios, videos, white papers, and other information products in the real world. How to sell more book, ebooks, multi-media books, audios, videos, and other information products.